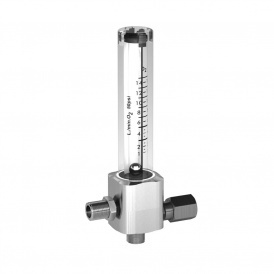 The flowmeters “A/S” are produced in acrylic material (PMMA), fitted on a metallic body with the regulative needle valve. Max. thermal endurance is 70 °C.The flowmeters with the lateral connections are suitable for measuring of the therapeutic or welding gases (Oxygen, Air, Nitrogen, Nitrous oxide, etc).